The Oceania Whip-Off Championships presented by Spank finished out the night on a high note – actually a very similar high to the year before. Ryan “R-Dog” Howard and Casey Brown repeated their wins, despite a monster new whip hit, which could have thrown a wrench in their programs. Howard said he figured the number of runs he logged and his double-trouble approach, whipping left and right, likely dialed it in, Brown might have had to step up her game to compete with one of the deepest female fields the event has ever seen were it not for her phenomenal skills. 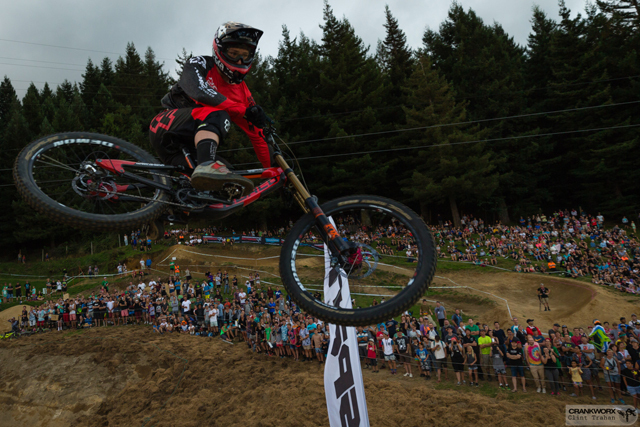 “A lot more women came out this year and we were sending it on this jump. That’s an intimidating jump for anyone. It makes me so excited to see that,” she said. The original creator of the event, judge Sven Martin, noted the purpose-built jump really pushed the riders and lead to some pretty amazing sideways actions with a big step-up, built for more risk, higher pop, and a sweet berm at the end to skid and spray the spectators. “Every year it gets crazier and this was maybe the craziest year,” he said, noting R-Dog was considerably more sideways than one usually sees.